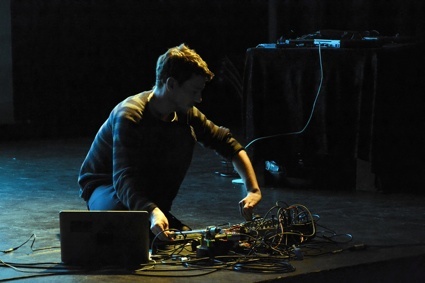 Brussels based sound artist, defined as a media saboteur by the Consumer Waste label, he seeks to fold the sound materiality in on itself using basic means in the form of objects and videos or during installations and performances he has presented in many places and festival in Europe and further. His flagrant disregard for the accepted norms of audio behavior appropriates unusual machinery for the playback of audio media: using an angle grinder to perform the live destruction of a microphone or using opened hard-drives as turntables. His releases activity is equally deviant, releasing silkscreen records or a 7” single without a central hole and a record composed from recordings of vinyl being scratched by scalpel. His Phonotopy label proposes a conceptual approach to recording media and he also curates the DRIFT series on the Artkillart label which overlays several grooves onto a single record, causing randomised playback. In the Quad Core project, he is interacting with computer data storage as a raw material to produce full control and unpredictable instruments. Several hard-drives is used as turntables, hacked in many different ways and crossing the entire range from analog to digital and reverse, creating physical rhythms, feedbacks and deviant behavior making appear a radical minimal noise techno.